Community Ministries are outreach efforts supported by the church and her members which directly serve the needs of the greater Marshall community. Martha's Kitchen serves meals every Thursday evening in the Trinity All Saint's Hall. This ministry was established at Trinity in January 2004. A translation of an age-old Jewish tradition, prayer shawls bring comfort to those facing a particularly difficult time in their lives or grieving the loss of a loved one. The shawls are given by request and each shawl is blessed by the Priest before it is delivered. 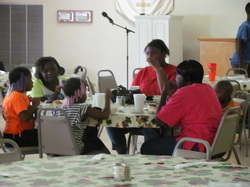 The Outreach Committee provides financial assistance to organizations in our community that aid those who are in need. Good stewardship allows us to serve God through the work of organizations in our community. We invite you to join our committee to help serve the Lord.